Beulah McNeil was born January 23, 1953 in Rowland, NC to the late Willie and Mattie Fladger McDaniel. She departed this earthly life on Monday, June 11, 2018 after a brief illness. She received her education in the public schools of Robeson County, NC. She had a passion for cooking and she loved cooking and feeding others. Beulah loved singing; and one of her favorite songs was "When the storms of life are Raging." To know Beulah was to love her. 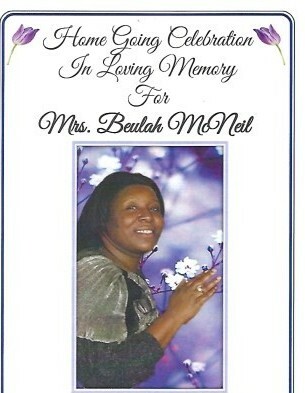 Beulah leaves to cherish her legacy and memories ~ her children: Jessica McNeil, Solomon McNeil, Kimberly (Damon) McNeil, Lawanna McNeil, James McNeil, Jeremy McNeil, Angela McNeil, and Patricia McNeil; six brothers: Willie (Louise) McDaniel of Fairmont, NC, Lavern McDaniel (Helen) McDaniel, Joe McDaniel, Wilbert (Mary) McDaniel, Larry McDaniel, Charles (Brenda) McDaniel all of Rowland, NC, and Roy (Jackie) McDaniel of District Heights, MD; two sisters: Judy Davis of Riverdale, GA and Doris (Alton) Barnes of High Point, NC; nine grandchildren and a host of nieces, nephews, other relatives, her church family and friends.